Neel & Neeraj's celebration actually spanned across two separate events in two states. The challenge here was designing a format that would allow them to invite different sets of guests with some overlap and have each the guest feel like they weren't missing anything. This invitation was oversized for the wedding celebration hosted in a botanical garden in Virginia and featured a vellum sheet with a reproduction of a painting. A custom-made petal-fold housed it along with the wedding invitation and inserts. The invitation and all inserts were produced as 1-color letterpress on Canaletto paper. Versions for the bride's side wording and groom's side wording were also produced. 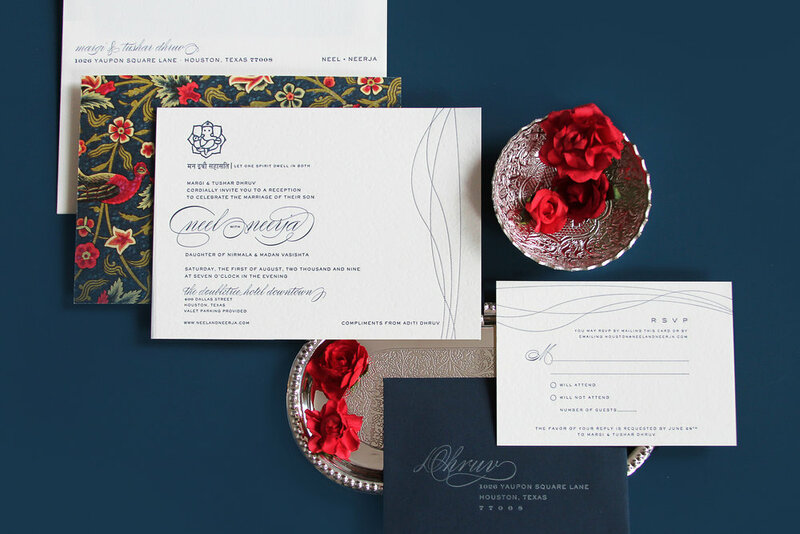 Under the invitation, the guest found inserts for the Sangeet and reply card and if they were invited also to the Texas reception, the separate invitation was also included. Reply envelopes were letterpressed in silver while the outer envelopes were letterpressed in navy. The Texas celebration invitation was sized to a standard wedding invitation size so it could also be mailed separately, if needed. It featured a double-sided invitation with digital offset printing on one side and 1-color letterpress on the other. A coordinating reply card was also included. Other items designed for the weekend of included sangeet programs, lunch boxes, ceremony programs, cocktail drink signage and passed hors d'oeuvre signage.